These are unusual political times. When I first started writing this blog the risk of fascism was present, but thankfully remote. The rise of the populist far-right was not unimaginable, but in the form it then took was hard to realistically foresee. The UK leaving the EU was quite impossible to predict. And that immigration would rise to the top of the political agenda seemed particularly unlikely. About as unlikely, to be candid, as it was that the FT might seriously discuss the end of global capitalism. But times change. Prevailing opinions do too. And the failure of the body-politic to address the issues arising from the 2008 global financial crash has changed a great deal about the UK. What that means is that we have to think differently. All of which is a long winded way of saying that a while ago I may have found it difficult to discuss a book on protectionism on this blog, even if it was written by a friend of mine. And now I don't. Now I think that even if we find ideas uncomfortable and we think that they challenge our long held perceptions then we still have to consider them: changed political sentiments requires that those with progressive inclinations rethink what they have to offer and why if they are to continue to shape the fortunes of people in this country and elsewhere in ways that social justice suggest desirable. 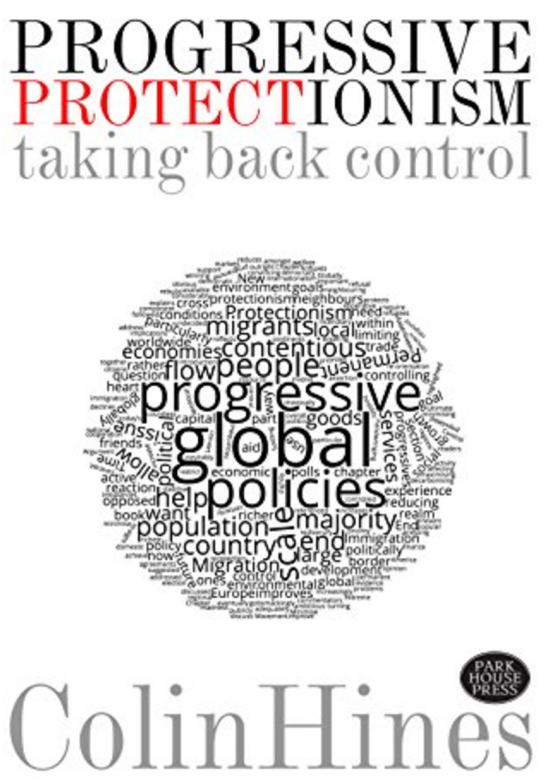 A new book called Progressive Protectionism by Colin Hines, who is the convenor of the Green New Deal group, provides some such uncomfortable thinking. I do not agree with all Colin says, and nor do many in the Green New Deal group, and yet what Colin has to say is now both timely and maybe even necessary. What Colin does in his book is argue that the long held treasured pillars of the European Union are inappropriate. He does not actually argue we should leave despite that. What he argues instead is that the Treaty of Rome that underpins that whole edifice should be amended and replaced by what he calls a Treaty of Home. The essence of Colin's argument is that global capitalism is not working. And, given that Colin is a long time environmentalist (having been around that scene since it near enough began), what we should do to replace it is build strong local economies. This is not only green, but he also argues it is the way to tackle many other issues. Capital controls, for example, would let us more effectively tackle tax abuse and so build a more equal and just society. They would also end a focus on speculation that is creating massively harmful inequality in our country, and others. Controls on trade would, Colin argues, support local economies and jobs and massively reduce the enormous carbon cost of much of world trade. But, and this is where for many the argument will be uncomfortable, this also requires control on migration. For many on the left this is a taboo even though as a matter of fact we have not had uncontrolled migration into the UK within living memory. The shibboleth of migration haunts discussion of left wing politics despite the reality that it has never existed. So let's be clear what Colin does not argue. He does not argue anyone should have to leave their country of residence. And nor does he suggest there should be no migration: he is quite explicit about the fact that there will be many reasons why it can and should exist. But equally he argues that economic migration is not a virtue, and even that is troubling for many. Colin has been banned from some left of centre discussion forums for even raising it as a concern. Candidly, that shows the small-mindedness of those making such decisions. That's not least because, as Colin carefully documents, our open doors policy for those who train in poorer countries and then work here denudes those countries of the skills they need to provide a better standard of living for those who live in their home countries and is little better than a new form of economic colonialism on occasion. We extract people and their incomes from other countries as surely now as we once extracted the raw materials and products of those countries at an undervalue in the past. In that way Colin argues that a policy that deliberately fosters the idea of encouraging people to stay where they are, and builds foreign and aid policy around that goal is now not just a priority, but an issue of social justice when data shows that most migrants move the minimum distance possible from their homes to achieve their goals. Does the argument work? I suggest you need to read the book to find out. Many will not think it does. I suspect Colin expects that. But I admire his courage. What he is doing is offering a radical, left of centre, concerned view on the way the world should develop if social justice is to be achieved. And whilst facing some of the issues Colin raises may be difficult for many those who are serious about building credible left wing politics that can and will win electoral support should now be willing to recognise that the assumptions on which old edifices have been built do need to be challenged, if only to find out what is really worth retaining and what is worth discarding. Colin's book offers a chance to do that. And that's why I think what he is offering is of real value, not least because he focuses on solutions, and they're in short supply right now. Available only as an ebook from Amazon (and Kindle is a free download on any computer). Well said, Richard. I hope that Colin’s book gets widely-read, and taken seriously. One crucial pragmatic reason I particularly hope this is the political reality now is that the ‘progressive alliance’ parties will fail in 2020 EVEN IF they (we) manage the incredible feat of pulling off a progressive alliance, if we are wedded to what sounds to the public like open-door migration policies. Ordinary working people, future generations, the poor, non-human animals: all these are relying on us, and we do them no favours by signing up to ‘pure’ policies/rhetorics which are hopelessly out of kilter with what the vast majority in this country want: http://neweconomics.org/2016/11/can-no-48-strategy-brexit/ – 56% of Remain voters want increased border controls and a cap on EU migrants – yes, that’s not Leave voters, that’s _Remain_ voters! Taking one example (migration): the tendancy for the NHS (& its sub-contractors) to hire from abroad. Is there a correlation between the increase in this and the rise in costs (to the person concerned) of training to be a doctor or nurse in the UK? Is there a correlation between supermarkets putting increasing pressure on farmers on pricing and the rise in non-UK citizen employment in the farming sector? Controls on trade? Why not local-content rules – much loved by South Africa and Brasil with respect to renewables. Given the UK’s off-shore wind programme (the largest in Europe) it seems mad not to have local-content rules (& yes technically the EU could prevent this – but there are always ways to game the system – ask the French). The original EEC formed at the time when the US was remarkably successful so a long term vision to create a United States of Europe was a very easy vision to believe in and sell. To say this is no longer the case is to put it mildly. The US is in poor shape and I still can’t get over my horror of the president elect; keep on hoping it like Brexit it is a bad dream. I can’t see it ending well. EU immigration has been extremely badly handled by the UK government. I won’t go over old ground here but it is clear that the Government has been economical with the truth, consistently blaming the EU for its own failures. It is interesting that after ignoring the EU rules for years they are now waking up to the rule that if you are a non British EU citizen and not economically active you can only stay 3 months unless you have private health insurance. Immigration/migration is indeed an important issue and I do struggle with it. It is clear we are failing large section of the community in the North of England and elsewhere. Neoliberalism is to blame far more than immigration, but perception is very important and the increasingly neo-fashist right wing press adds to this. As a foreigner (Irish citizen) I have equal rights to UK citizens under the 1949 Ireland act (as indeed UK citizens have in Ireland under a reciprocal agreement). This now appears to be in jeopardy. There is an ominous feeling in the air and there is worry that the UK could move very far to the right. I very much admire Colin for new thinking and the book at £5.99 for an e-copy http://progressiveprotectionism.com/wordpress/ is definitely on my reading list. Forty years there were people telling teachers like me we had to educate for leisure as automation would mean a shorter working week and we would still be better off. Obviously it didn’t happen, indeed, in many ways people are working longer. There is, in a way, an analogy with the competition from immigrants. Digital intelligence can replace people and they don’t need pensions, housing, health care and don’t go on strike. Our potential to produce wealth -goods or services-is probably higher than it has ever been, restrained by the capacity of the planet’s resources and environment. Governments compete with each other to attract e.g. car manufacturing, so as to have people in employment. Yet modern factories do not employ the numbers they used to and the cost of the jobs is higher. In many ways we are still with the model of the industrial revolution, where ‘hands’ were needed and idleness diminished the potential wealth. People not working meant fewer resources for distribution. It was a scarcity model. Capital had to be accumulated to invest in new ventures and was equally scarce and, held by the few. In a resource depleted world, it will make sense to produce locally and avoid huge amounts of transporting around the world. It could be that a few operate very productive manufacturing plants and more people make things locally-‘less efficiently’-but maybe in a more satisfying way, as a craftsman as we don’t need to maximise production in the way we did in 1917. Of course, this will meant a shift in attitudes about consumption (ever increasing wealth ) our concept of society, co-operative or competitive, and what wealth really is. And in ownership and direction of investment. That is, I recall, what your books deal with. At last – someone has said it! Thank God. Or rather thank you Colin and thank you too Richard. I’m going to read this. I’ve had a feeling ‘in my water’ about this issue for a long time and I have always tried to present both sides of the argument if I post here. What we need less of in the future is huge genralist policiesconcerning immigration. Instead we need need more intervention in the form of mirco policies to look at and mitigate the impacts of immigration at a local level and a controlling influence on immmigration per se. I also think that trade unions working with employers should have a role both in protecting established and immigrant workers from abuse by employers. It is not immigration per se that is necessarily the problem; it is human and organisational behaviour around it that also has to be considered surely? But this book is indeed very important and thanks once again. Slightly ironic that you mention tax abuse and then reveal right at the end that the book is only available from Amazon….?! I wasn’t trying to criticise. Just point out the irony that if people want to distribute stuff widely they need to use a company that is diametrically opposed to what they are arguing for. I promise not to make any light hearted comments in the future! Just downloaded summary. Hate to think of having to download a kindle ap to read it – much prefer a proper book – so I’m hoping I don’t like it. But this is unlikely since I have been railing against that damn Ricardo for years. I’ll read Colin’s book with interest and on capital controls, I have some sympathy with what he’s saying, although I think more democratic accountability of capital and more equitable ownership of capital are the key reforms we need – if we don’t achieve those then restricting capital’s ability to move across national borders won’t help that much. On restricting immigration (and emigration) I’m more sceptical – most empirical studies show substantial benefits to the UK from immigration, and (given the earnings differentials between the UK and economies like Poland and Romania) if we say that people from central and eastern European countries can’t come to the UK to work then we’re effectively forcing them to accept low wages at home, which seems inequitable. But as I say I’ll read the book with interest. At the micro level of individuals, free movement makes sense but we also need to look at the macroeconomic impact on the longer term stability of the global economy. If skilled workers move from a poor country to a rich one this tends to increase inequality within the rich country (by keeping labour costs low) and between the poor country and the rich country as the poor country losses it skill base. It also means that both countries are less likely to invest in skills because the rich country thinks it can access skilled workers without paying and the poor country becomes reluctant to train because the skills leave. I think the only solution is to make sure you invest in poorer regions, by creating infrastructure, supporting training and innovation, and giving small businesses a chance to compete (most current tax policy give largest corporations all the advantages). Question is, on what scale do you want to do this? National, transnational (like the EU, terrible on tax, think double Irish – Dutch sandwich) or global. Probably a bit of all three but it is a hard sell to most electorates unless everyone can see that it is working for them. Charles I think your last paragraph really captures the essence here and the question of scale is vital. We don’t even need to look to the global stage for information we can just look at England and compare London and the South East to the rest. Capitalism feeds from the bottom up, remove the bottom from an area, or pick an area without a real bottom, and all the higher level feeders move on. Some higher level remains but it tends to be in the form of scavengers. We talk a lot on here about the necessity of redistribution but rarely about how that conversation should include people. It’s one of the main reasons I am so supportive of a full liveable UBI. It can supply that bottom level that attracts, or retains, the other levels that give the sort of structure/progress wealthier areas enjoy. Taking the macro view there are 3 main reasons people move, natural disaster, war/terror/repression and economic. Yet we continue to treat economics as if it’s a force of nature and not our own creation and malleable to change. It’s interesting how terms go in and out of fashion and acceptability, prime example Bernie Sanders declaring himself socialist and still being popular in the US. The strange bit is that, while the US may not have been as socialist as Europe, the US has still embraced plenty of socialist policies. In exactly the same way protectionism never stopped but the use of the term was discouraged. The big US trade deals are all heavy on protectionism they just don’t protect people. Or rather they only protect those with capital/wealth or IP to look after. Big agri and big pharma being two prime examples. We are constantly told that things would have been worse with protectionism and that it would have held back the third world. Same goes for capital controls, privatisation and labour laws.